2015 Indian Roadmaster Indian Red/Ivory Cream, Come check out the new Indian Motorcycles and get the Best Customer Experience and Unbeatable Prices! Call us today 770-752-9160! 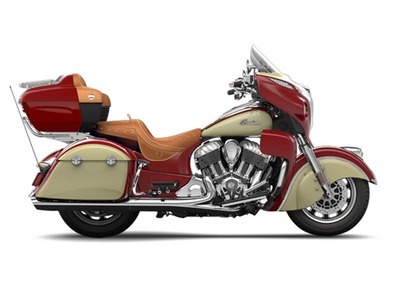 2015 Indian® Roadmaster Indian Red/Ivory Cream A STORIED SOUL IN A BRAND NEW BIKE. The 2015 Indian® Roadmaster reflects pure American Luxury. Building upon the iconic Roadmaster name used by Indian in the 1940s, the new Roadmaster reimagines Indian Motorcycle comfort, styling and performance out on the open road, for the long haul. Features May Include: Horizon Power Windshield Adjust this new Horizon Power Windshield with push-button adjustability to customize airflow, provide weather protection, and reduce glare Storage Over 37 Gallons of weatherproof storage in the convenient saddlebags, roomy trunk, lowers, and fairing including convenient front storage in the lowers that s easily accessible to the driver while riding Heated Seats Heated rider and passenger seats with individual controls and high and low settings Heated Grips Adjust heated grips for the right temperature with ten settings Adjustable Passenger Floorboards Give your passenger the ultimate riding experience and leg room comfort with adjustable floorboards High Flow Air Cleaner Boost the performance of your Indian® Motorcycle®, create more legroom on the left side of the engine, and enhance the style of the Thunder Stroke® 111 V-Twin. The Big Sucker intake lets the engine inhale more freely for a slight performance gain, and it enhances throttle response. Pinnacle Heel Shifter The adjustable Chrome Heel Shifter adds extra style to your Indian® Motorcycle®, and it accommodates riders who prefer heel shifting. Chrome Trunk Armrest Supports Add passenger comfort to your bike with adjustable chrome trunk armrests. The armrests pivot across a wide lateral range so they can be positioned close to the passenger s body or spun all the way back so they are alongside the trunk when not in use. Trunk Storage Add extra storage to your bike's trunk with new storage accessories. The Chrome Trunk Rack and Trunk Rack Bag add style and space to your bike. The trunk organizer & trunk bag give your another way to organize your things. All Indian pictures are kind of Indian HD motorcycles picture was taken, including motor fuel gauge, engine, engine mounts, tires, fuel tank, the car handles, lights and so on, 2015 Indian Roadmaster Indian Red / Ivory Cream full-screen viewing,2015 Indian Motorcycles today Price: $21,799 .